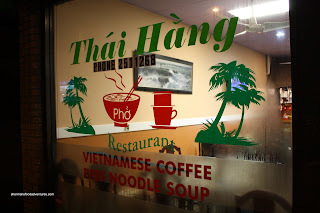 What began as a simple suggestion by Karl (the friday lunch) about meeting up for dinner at Song Huong for their Beef 7-Ways dinner, ended up to be a little more. How much more? Well, first of all, we had a venue change. 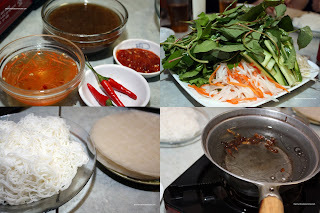 Instead of Song Huong, we decided to try Thai Hang's version of the same meal. Also, we had a few more bloggers joining us for dinner. Kim had originally planned to join us. But now, we also were graced with the presence of Anita (La Petite Foodie) and Jessica & Mark (Yum-0-Rama). It almost seems like that we travel like a pack of wolves eating our way through the GVRD. Whatever the case, the more the me rrier since we can eat more as a group and enjoy differing opinions (which is a great way to experience food). Honestly, I knew about the Beef 7-Ways; yet I've never had it. It's actually quite difficult for one person to eat it and frankly, it's advertised as a dinner for 2. With 6 of us, it looked to be a good way to try it and it started fast and furious. Despite the large table, it was completely full from just the first course. 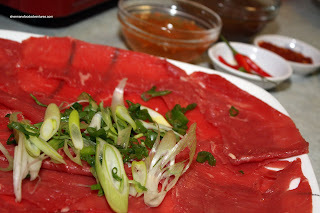 We began with the Beef Toro, which we had to blanch ourselves in a hotpot on top of a portable burner. 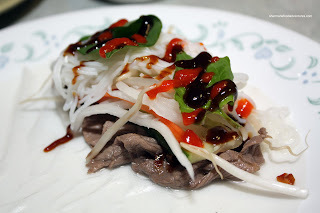 We had cooked rice ve rmicelli, condiments (peppers, nuoc cham, sriracha & anchovy sauce) bean sprouts, cucumbers, pickled daikon/carrots, mint leaves, Thai basil and perilla leaves (?) as suggested by Karl. In addition, the most important item, the rice wrappers were supplied dry. With a hot bowl of water, we soaked the wrappers just prior to using it to create our own beef rolls. The beauty of this meal is the interactiveness. There is something novel with making your own food despite the fact you are paying for it. Count Chinese hot pot, Japanese sukiyaki and Korean BBQ as other ways to joyfully cook for yourself. 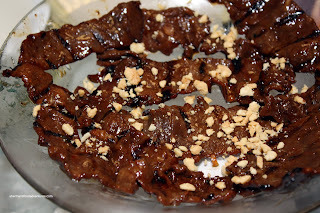 Our second course consisted of Beef Satay. It had nice grill marks and was a bit sweet. The meat was relatively tender and provided a much different flavour profile than the blanched toro. We were all furiously constructing our very own masterpieces with the rice wrapper; but honestly, they were the furthest thing from works of art. Working with the extremely sticky wrapper, most of us ended up with rolls resembling intestines spewing out puss (sorry for the analogy). Being very hard to keep together, the only solution for Karl and myself was to stuff the whole thing in our mouths. Made for an interesting chew. At least it stayed in one piece. Our 3rd, 4th and 5th courses consisted of rolled meat/meatballs. Hey, I'm all for rolled meat or meatballs or anything of that sort. In fact, serve me meat on a stick, in a cone or in a spoon, I'll like it! 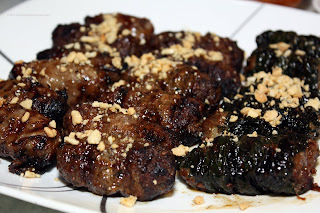 The Bo La Lop resembled Greek dolmathes (except consisting of meat), however this one was not wrapped in grape leaves, rather an herbal pepper leaf. One bite into the sweet juicy meat revealed onion and lemongrass flavours. It's important to note that 2 of the 7 courses were unavailable. We did not get to try the Beef Tendon or the Shaking Beef. We did get one more course in the form of Beef Congee. 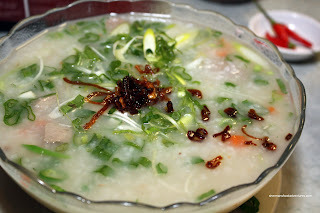 Loaded with scallions and minced beef, this was similar to Chinese congee except being sweeter and a little thinner. By this time we were stuffed beyond belief. The combination of carbs and meat left us moaning and groaning. And we still had dessert! Once again, an interesting and satisfying meal shared with like-minded people (well, in Kim and my case, twisted...).